Want to see what's upcoming? Click the calendar for our future trips. 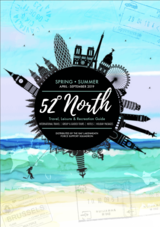 Click the cover for a copy of our current travel book! We depart early morning and make our way to the ocean city of Plymouth with its long distinguished Naval History. Spend your free time at the vibrant Waterfront or maybe take a boat trip around Plymouth Habour (extra cost) before we check in to our hotel in the Plymouth area. 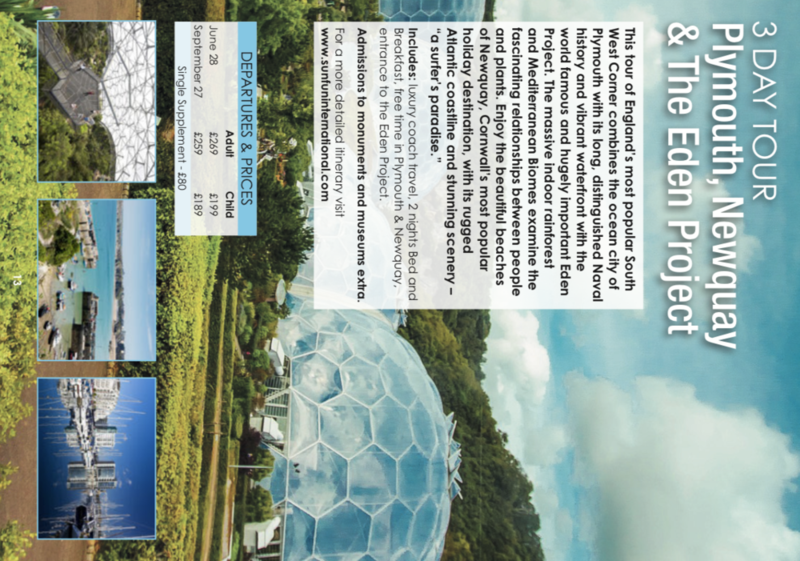 Following breakfast, we depart the hotel and head towards one of the tour's highlights, the World Famous, and hugely important Eden Project. Visit the massive indoor rainforest and Mediterranean Biomes examining the fascinating relationships between people and plants. After several hours exploring the amazing Eden Projects, we travel on to the stunning coastal holiday resort of Newquay. Enjoy the beautiful sandy beaches of this popular resort, renowned for being a "surfer's paradise". We return to our hotel in the evening. After breakfast, we depart the hotel and begin our homeward journey with comfort breaks en route. We will stop at the Clarks Village Shopping Outlet where you'll have time to shop and grab something to eat (time permitting) before our final stretch of travel. We arrive home mid to late evening. Itinerary Subject to Change - admissions to museums and monuments are not included. Before you book a trip, you must read, understand, and accept all conditions and disclaimers from the ITT Website. After reading the conditions and disclaimers, choose Yes under "Confirmation". 1. I understand that it is my responsibility to provide all required travel documents for myself, my family, and any visiting persons. For travel booked through ITT all passengers must travel with a tourist passport; for further guidance please go the https://www.fcg.pentagon.mil website or contact the MPF Passport Office at DSN 226-1210/Commercial 01638-52-1210. Passport holders other than US or EU countries should consult with their embassies for any possible VISA requirements. 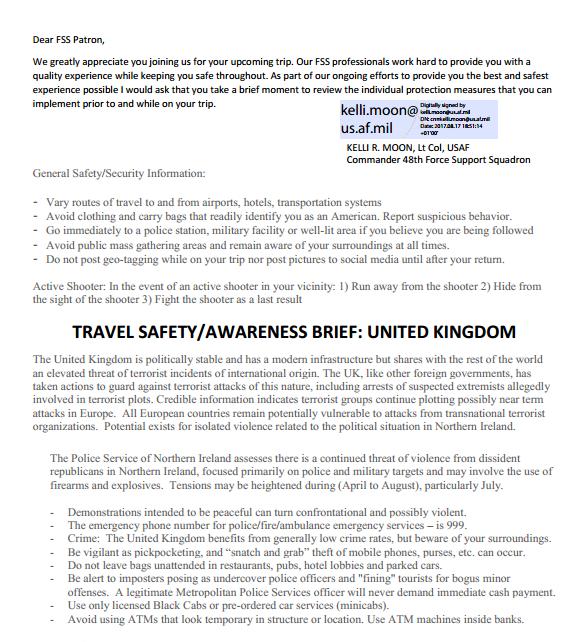 DO NOT TRAVEL WITH YOUR GOVERNMENT PASSPORT AND/OR ID CARD ONLY. 2. I understand that it is my responsibility to be at the departure point at least 15 minutes prior to the scheduled departure time. The ITT Office is not responsible for persons missing coach departures at any point during the tour, for any reason whatsoever. There are NO REFUNDS for failing to be on time for the coach departure or for not being at the correct meeting point at the correct time. It is the customer's responsibility to contact the ITT office within 3 days of departure in order to obtain the correct departure time and location. It is also essential to provide a current phone number where you can be contacted in the event of any time or departure location changes. It is not the responsibility of the ITT office if messages left at your office are not given to you; or if the contact number that you provide is incorrect and we are unsuccessful in contacting you because of this. 3. These trips are through contracted agencies. The ITT Office, 48th Support Squadron, and USAFE act only as agents for various contractors and are in no way responsible or liable for their obligations, accidents, delays, or losses. Display of information and booking arrangements are provided as a service and therefore do not imply endorsement of any commercial business or product. 4. PURCHASING TRAVEL INSURANCE IS STRONGLY RECOMMENDED. You are free to cancel at any time outside of 14 days prior to departure on specific trips. A cancellation within 14 days of travel, without the transfer supplement offered by the ITT office, will result in A LOSS OF ALL MONIES PAID, AND ANY BALANCE REMAINING WILL STILL NEED TO BE PAID IN FULL. NO REFUNDS WILL BE GIVEN FOR ANY REASON WHATSOEVER, INCLUDING EMERGENCY DUTY REQUIREMENTS OR ANY THREATS AND/OR TRAVEL RESTRICTIONS THAT MAY BE ISSUED AT/OR AROUND TIME OF TRAVEL. Full refunds are only given if the contractor cancels the tour. Transfer Supplement must be purchased outside of 14 days prior to travel or at time of booking. Due to security reasons we can no longer post departure times and locations. Please call the ITT office Monday-Friday 11am-4pm for trip information. This site is intended for the use of the Air Force (or military, DOD, government audiences) only. Do not reproduce or distribute the content of this side to a wider audience without coordination with the information owner, your unit legal and public affairs offices.